Chuo Gyorui is a specialized trading company handling about 500 categories and 2,000 items of seafood varying from premium fish such as tuna,globefish,and uni(sea urchin roe),to popular fish such as horse mackerel and mackerel pike and processed products such as kamaboko(fish cakes)and chikuwa(fish sticks). Naturally,each type of product has different suppliers and buyers coupled with varying supply and demand. This explains why Chuo Gyorui has many different divisions, each of which is specialized in handling the kaleidoscope of possible permutations and choices. Employees of each department and section have special skills. For example,the employees in the Tuna Department must have a worldwide knowledge of different tuna species and qualities as well as sales skills at auction. The Restaurant Fish Department must understand popular fish selling well in the domestic market,while the Processed Products Section may be engaged in developing new commodities in cooperation with food processing companies. Consequently,the professionals in each division of Chuo Gyorui are well versed in the markets for marine products. The main operation of this department is to collect and wholesale ordinary fresh fish landed from home and abroad.Attention to detail is paramount in maintaining freshness. The main products are sardines, horse mackerel, mackerel pike, yellowtail, bonito, sea bream, flounder, octopus, squid, young yellowtail, Spanish mackerel, etc. This department collects and wholesales frozen and salted fish produced both at home and abroad. The main items are frozen salmon, frozen trout, frozen crab, frozen octopus, frozen blackcod, salted salmon, salted herring roe, salted salmon roe, etc. This department collects and wholesales ordinary fish and premium fish and shellfish landed at home and abroad. It deals in live fish such as yellowtail, sea bream, amberjack etc. globefish, ark shells, scallops, abalone, oysters, sea urchins, etc. In recent years, demand grows especially. The demand for such live fish in particular has been growing in recent years. The other main items in addition to above are globefish, ark shells, scallops, abalone, oysters,eels, dungeness crabs, king crabs, snow crabs, freshwater fish, etc. This department mainly collects and wholesales different tuna species. Since tuna fishing grounds are distributed worldwide, good information-gathering skills are a must. In the Japanese tuna market, prices are mostly determined by auction, so sales skills at aucion are indispensable. A skilled auctioneer can sell 200 fish in just 30 minutes. The main items are southern bluefin tuna, bluefin tuna, big-eye tuna, yellowfin tuna, striped marlin, and swordfish, etc. This department collects and wholesales a variety of dried and semidried seafood products as well as processed marine foodstuffs. 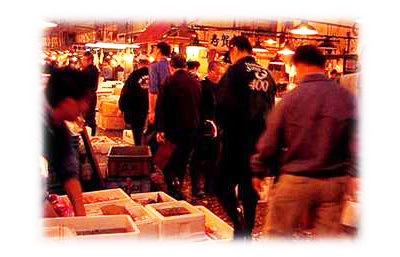 The main items of dried and semidried seafood products are dried squid,dried sardines, semidried split horse mackerel and mackerel pike, whitebait along with various other dried and semidried fish, and sliced fish, kamaboko fish cake, chikuwa fish sticks, smoked salmon, tamago-dofu (steamed egg custard), hamburger, etc. are the main items of processed marine foodstuffs, The wide variety of imported items has increased in volume recently.